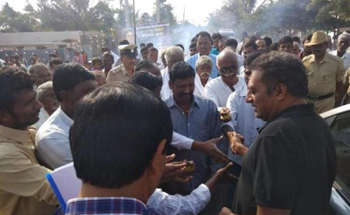 Chitradurga, Jan 27: Actor Prakash Rai on Saturday visited Bandlarahatti village in Hiriyur taluk to learn about the fluoride problem in the village. The multi-lingual actor interacted with the villagers and had first hand experience of the fluoride problem. He vowed to make the village fluoride free and sought the help of the villagers for it. "With your support, we can overcome the problems of the village. Everyone, irrespective of party affiliations, should join hands in addressing the fluoride problem in drinking water and in making Bandlarahatti a model village," he told villagers. Water expert N Devarajareddy explained to Prakash Rai about the extent of fluoride in the water and ill-effects of it on the people of the region.